The original $10 DIY Arduino data logger was posted in 2014, and there have been several significant updates to the way I assemble the basic three component design since the early version described here. If you are building your first data logger you might want to start with this page: ☀ How to Build an Arduino Data Logger ☀ which links to more recent build instructions. As the build improved, I stopped using the Pololu power switch described here, as it ended up using more power than the sleeping loggers themselves. Also note: The Pololu power switch described in this post has been superseded by the vastly superior Adafruit TPL5110 Low Power Timer. Cfastie has been putting this board through it’s paces over at PublicLab.org. Several sources recommend pullups on CS, MOSI, MISO and SCK, though the loggers will usually work ok without them. But testing has shown that some SD cards take a very long time to go to sleep unless CS, MOSI & MISO are also pulled up. The addition of the power switch solves the last nagging problem I had with the original 3-component design: unpredictable system behavior when the power supply goes low. I knew from my bench tests that some boards (like the Rocket Ultra pictured here) gracefully go into a kind of holding state till they completely brown out, while others go into a kind of power cycling loop, alternating off & on, when the battery voltage gets too low for the regulators. Now, you can just read the divider and drive the control pin high to shut down the entire system. Of course, everything is a trade-off, and this soft switch almost doubles the sleep current, from ~0.35 mA (with a good SD card!) to ~0.6 mA. Assuming 2000 usable mAh per AA, this brings my “back of the envelope” estimate down to 4-6 months on three cells (my design goal is of 1 year of operation). But given all the uncertainties I have dealt with regarding μSDcard power drains, battery leaks, and the rough and tumble of real world deployments, I think I will pay that price to protect my data. It’s not always that easy to get back into those caves on schedule. On future builds, I will try to find a simple latching relay circuit to get back the capacity I’m losing with the Pololu switch. The SD card debacle forced me to make my first breadboard version of these loggers to measure power consumption at the component level . All my previous builds were soldered, and now that I know how fast bread-boarding is (~45 min , mostly for soldering the header pins) I realize that was a mistake. And I also finally got around to posting the drip logger script for this platform on the project’s Github. Even though the drip sensors only use an ADXL345 (for now), I left in all the other sensor support developed for the flow monitors, as the system is meant to be easily adapted to other applications. I also have two different versions of sleep code buried in there, one with the Rocket Scream low power library, which shuts off the BOD, and the other which just uses a variable WDT timer to wake from sleeps while the fuses are left on. I still have not decided if I am comfortable with BOD fuse shutdown in a data logger application. With a 10k limiter keeping the led current low, I sometimes leave the indicator pips on during sleeps without impacting the power budget too much. 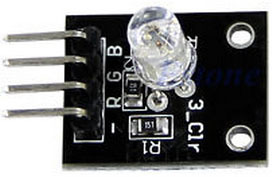 If you change the limiter to make the led brighter, make sure you shorten the time that the led is left on. 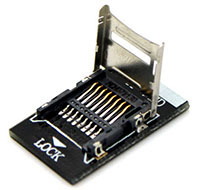 *Clones work, but the “real” Sparkfun ProMini boards give me trouble with the SD cards. I suspect that a 22uF decoupling cap between the SD card’s Vcc<->Gnd lines might help the MIC5205 cover the current peaks. When the budget isn’t too tight, I splash out for better components. After you build a few, and go through the effort to install them, you will start to realize that your time is worth more. Certainly your data is. But I would still make your first few builds with cheaper stuff, at least till you feel confident putting them together. Cable routing inside a housing is important, and it usually takes me a few tries before I get the physical build sorted out. Well, there it is: the simplest fully capable datalogger I could come up with. You have from 3 to 5 analog lines free depending on your board (1024 levels on the ADC), and two digital lines left for your 1-Wire sensors (and you still have a free interrupt line on pin 3, and the analog pins can be used identically to the digital pins, using the aliases A0, A1, etc) . I2C is already pulled-up (4.7k) & broken out for you on the RTC cascade port. SPI is still available if you watch your timing with the SD communication. (Both get SCK, MISO, and MOSI in parallel, But each device needs its own Chip Select line, as you can only communicate with one device at a time : SoftwareSPI is also an option but it looses the speed advantage). 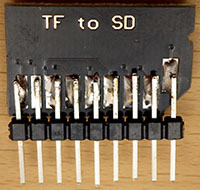 If you need better resolution on your ADC, you can add an ADS1015 to add four more 12 bit channels. If you need more output lines, you can look into adding a shift register, and there are plenty of transistor/relay breakouts if you want to control high power loads or LEDs. Once you have a unit up and running, don’t forget to give the boards (but not the μSD adapter) a good dash of silicone conformal coating before they go into the field. And it never hurts to throw a desiccant pack or two in there while you are at it. I tested two breadboard builds (configured as drip sensors) to get a sense of the current draw of the individual components. Without the power switch, the ProMini clone logger drew a sleep current of 0.26 mA sleeping in powerdown mode using RocketScreams Low Power Library with ADC & BOD off. Double length header pins make it easier to breadboard the SD card. 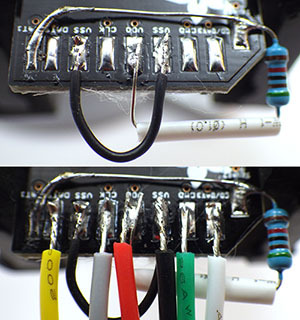 DO NOT TAKE TOO LONG to solder jumpers onto any of these adapter boards. If the springs mounted inside re-flow from excess heat, the connections are toast. Subtracting those figures from 0.26 mA indicates that the ProMini clone with its MIC5205 regulator uses about 0.052 mA when the unit is sleeping. I am guessing that most of that is due to losses on the regulator, since it is still providing power to the above components. Then I changed over to a RocketScream Ultra board, and the whole logger drew 0.22 mA with the same SD card, indicating that “sleeping” logger overhead with their MCP1700 regulator is around 0.012 mA. Significantly better than the 5205 based system, and you have another 100 mA of current capacity at the top end. I then tested that Rocket ultra unit with the Pololu power switch in the circuit, and sleep current went up to 0.53 mA , indicating that the switch is adding 0.32 mA to the sleep current for this design (after I removed it’s power on LED). Just to be sure about this I measured the current on the other side of the Pololu switch, and the logger unit was still drawing 0.22 mA, so it was not noise, or some other weird side effect keeping the SD card from sleeping properly. A month long test of one of these units binning at 15 minute intervals, with the Pololu installed (0.56mA sleep current) lowered the 3xAA power supply voltage by 181 mV. Being conservative, this means we will only get about 4 months of run time with the no-name alkaline batteries I used. That’s a pretty dramatic reduction of run time for that one extra component so I probably will not be using the Pololu switch for my longer term deployments. Field test results so far indicate that a unit sleeping at 0.30 mA will deliver between 6-9 months of operation on a 3xAA battery pack. Just thought I would post a quick shot of how I jumper the pullup on that SD card adapter with the legs of the resistor itself. 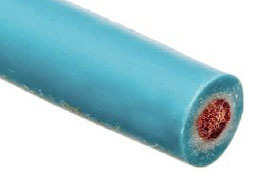 Super thin 30 AWG wire makes jumpering the ground line much easier as well. Once all the jumpers are on, I clean off leftover flux with 90% isopropl alcohol, and then coat the contacts with silicone conformal coating, being careful not to let it run to the other side of the board where it would block the connections. Then I adhere the boards to the platform with double sided tape, which has been working surprisingly well on ABS knockout caps. It is also worth mentioning that the Green channel on the multi color common cathode LED’s is so much brighter than the red & blue colors (4000mcd vs 8-900 mcd), that you can actually use two limiting resistors – one 10K on the common ground line, and an extra 20K on the green line. In fact, if you can live with a really faint indicator led, you can take the limiters to 20/40K or more if your LED is bright enough. You don’t want to waste too much power on indicator LEDs when no one is around to see them, and this brings the green channel down to 110uA, while leaving the red & blue channels bright enough to see. Luke Miller has an elegant method using a magnetic reed switch interrupt to enable & disable his status LED’s to save power, but I often need all the interrupt lines for my sensors. I could probably work around this with a pin-change driven interrupt, but have not had a chance to dig into that yet. I just wanted to add a link here to my new pvc housing design. While not quite as simple as the rubber quick cap housing pictured in the table above, I am certain that this Formufit table-cap based design is the simplest diy housing you could build that will go to significant depth under water. On my logger I use a voltage divider to monitor the main battery. This bleeds a few μA, but given the overall sleep current that’s a small price to pay for the simplicity of using two resistors & a cap to do the job. 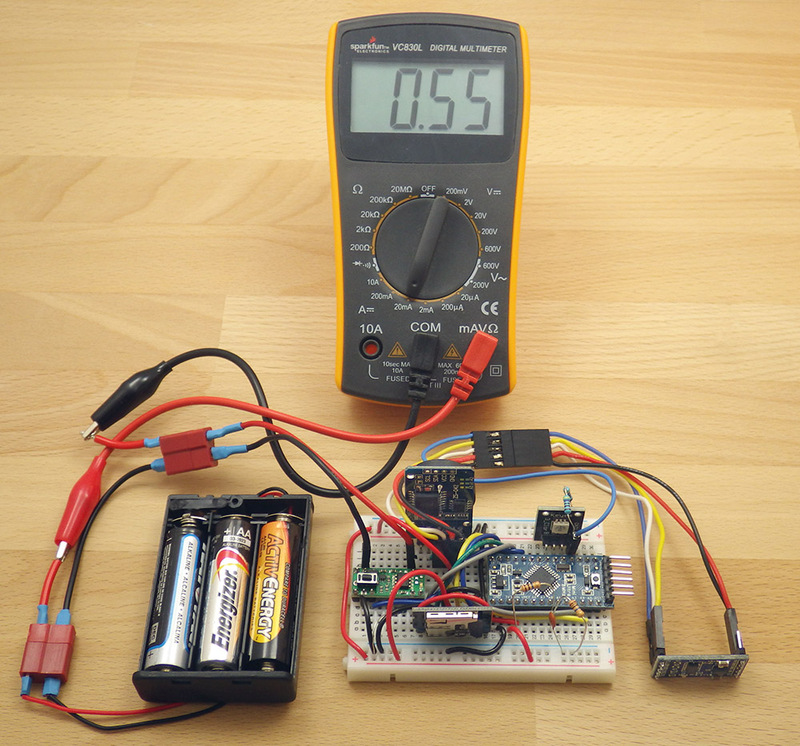 However I just stumbled across a very good way to monitor the battery voltage with virtually no loss over at the LowPowerLab blog. About half way down the discussion user JC suggests ” a resistor divider network, with the high side gated by a FET. Turn the FET on when you want to read the battery voltage, off the rest of the time. The leakage is somewhere down in the femtoamps.” Another elegant solution for me to look into if I ever get this project to the stage where I am actually implementing elegant solutions. It will be a while before I sort out all the details of the V3 logger platform, but for a preview of what might be coming, you can see a couple of builds currently on the test bench here. Also, after many successful field deployments without the power switch where the batteries died but the SD card data was still intact, I have dropped the Pololu power switch from the design. I just could not afford to loose all that power. I still prefer to use the rocket ultra as it’s voltage regulator is more efficient, but it is still possible to build a decent logger with the minis that should sleep below 0.25mA. 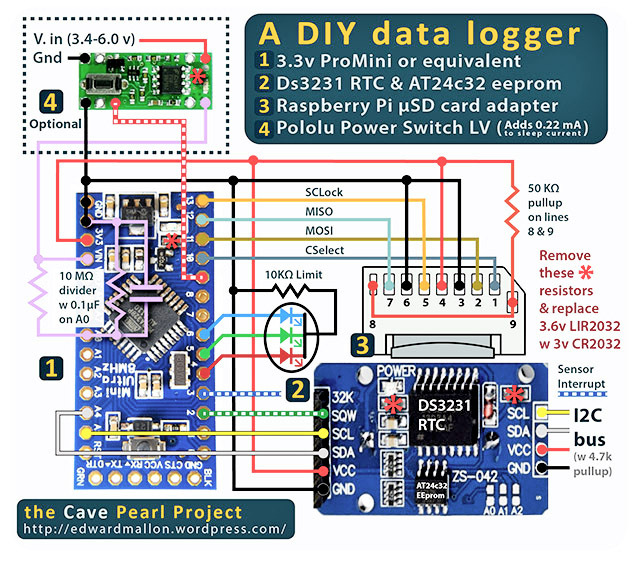 This entry was posted in DIY Build a Pro Mini Logger on October 7, 2014 by edmallon. Thanks for the great conversation today at the conference. You’ve inspired me to explore this. 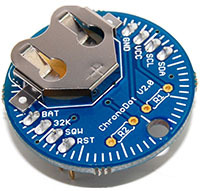 I want to make a pico Size board that can have a data logger for later downloading. I would like to attach some load cells or force sensors to it and record the input from each sensor (3-5) over a period of 6-8 hours for later downloading. I am not an electrical engineer but read your work carefully and am wondering if I could hire you to make such a board. Thanks. 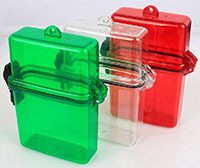 I have not used load cells before, but my understanding from various web tutorials [http://www.nerdkits.com/videos/weighscale/] is that they are usually designed as resistor bridges. So my first step would be to see if the amplifier gain required for a given load cell falls within the range of the kind of I2C amplifier/ADC breakout boards you find at Adafruit [eg: ADS1115 ] since their libraries usually mean heavy lifting on the coding side has already been done for you. 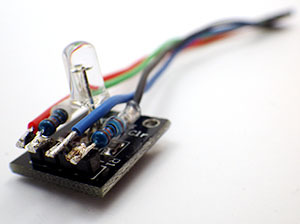 My logger script already works well with I2C sensors, so I suspect you would be able to connect a load cell like the ones from Sparkfun to the the Adafruit board and be up and running pretty quickly by just dropping in a library and doing a few basic code tweaks. I recommend that you dig through the research literature using Google Scholar, as many people have used load cell sensors for environmental monitoring. The most important thing you get from reading papers is as sense of whether the fundamental sensor technology has sufficient sensitivity & accuracy for the application you have in mind. This is much faster than discovering it on your own. Also check through the Ardunio Playground Forum, as people may have already discussed solutions to problems you might run into. P.S. Just stumbled across the HX711 Weighing Sensor Module on eBay. This looks like very inexpensive option for driving load cells. There might even be software like PCB Layout Artist that you can use to design a board by just dropping parts in and using the schematic and parts (and their respective schematics) here. This would make a sweet kickstarter. If I were you I would wait for V3 and in the mean time invest in some software to do the dirtywork for you after reading everything edmallon suggested. You can reduce the current consumption of your RTC by running them off a coincell. I have measured a much lower power consumtion via the batt pin as opposed to using the VCC pin. Alos worth looking into is turning all your sensors and the SD card off via a Mosfet when in sleep mode. You are quite right, and I have detailed my adventures pin-powering the DS3231 RTC in a different post. I will be adding those changes (and more) to the wiring diagram when I publish V3 of the DIY logger. However de-powering the SD card is more challenging due to the fact that most of the SD card libraries for Arduino don’t support repeated initializations. But if you have found a way around that problem I would love to hear about it. Thus far I simply test a variety of SD cards to find the best sleepers, which usually come in around 60-80 µA. With a pin powered RTC, and a “good” SD card, some loggers are getting down to about 0.12 mA sleep current if I also have low current sensors attached. hi Edward, as a caver in France, I’m following your logger blog from time to time. I see you’re planning to investigate on some other sensors. Just to let you know I’ve been testing the MH-Z16 CO2 sensor for some months, but it’s quite a power greedy sensor, which is also drifting because of warmup; while Cozir-based sensor loggers (I’m using the smaller minIR variants from the same manufacturer) are just working perfectly well for carbon dioxide level follow up while consuming almost no power at all. The UV-flux oxygen sensors are equally satisfying all underground tests, and they come in a similar packaging and pinouts as the minIR’s (both producers Scotland-based I guess they invested in a common serial communication technology which suits me well but unliuckily they don’t do I2C). Good luck ! Many thanks for the information, as power consumption is one of those things no one seems to talk about. My primary attraction to the MH-Z16’s is that they have been starting to fall below $50 on eBay, but I guess you get what you pay for. I’ve been patiently waiting for OSBSS to follow up on their SenseAir logger, but it seems that their project is on hold at the moment. My big question with any of the NDIR CO2 sensors is how the readings are affected by humidity, but of course, I also have yet to find a humidity sensor that will handle the 95-100% range of our study sites for more than a week or two before it croaks. Once the environment goes condensing, the RH sensors never seem to recover. What RH range is your site? Sandbox sells the MH-Z16 with a I2C/UART 5V/3.3V interface board, and I wondering if a generic version of that board could be used with the MiniIR sensors (as opposed to the SenseAir K-30’s, which are native I2C). How hard was it to get the Serial UART coms working?